Small town atmosphere with big city amenities. The Town of Edinburgh relies on groundwater to supply drinking water to approximately 5,000 customers in and around the Edinburgh area utilizing water from one well field. Water quality is our top priority. All the water we deliver to the customer meets or exceeds strict standards for public drinking water established by the U.S. Environmental Protection Agency. We collect thousands of water samples each year and send them to highly trained state-certified laboratories to be analyzed. We work hard every day to make sure you have a refreshing and steady supply of water every time you turn on the tap. To apply for water service please visit the utility office located at 107 S. Holland Street, to complete a service application and pay a meter deposit of $50.00. Water service requests completed by 2:00 PM will have same day connection and requests after 2:00 PM will be connected the next business day. Once service has been requested, a service call will be scheduled to read the meter and start billing with an actual meter reading. It may be necessary for a utility representative to enter your home or business to read the meter. An adult should be present when our utility representative comes to connect your water. Before your water is connected, please check to ensure all water outlets, both inside and out, are turned off to prevent water damage, which could occur from open faucets. If you are applying for service at a home or business that is not currently connected to our system, please contact our office staff at 812-526-3514. 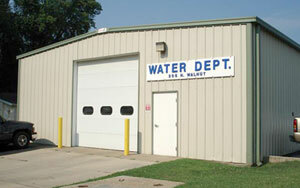 Please visit the utility office located at 107 S. Holland Street when you are ready to have your water service disconnected. Advance notice allows us time to take a final meter reading and ensure that you are only charged for the water you use. ADA Public Meeting Notice 12/10/18 5:00 P.M.